Beth Eagle-Brown swam a new club record and won two bronze medals. 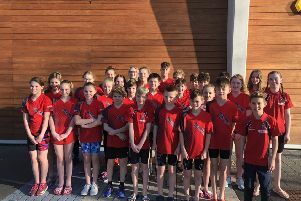 Three Deepings Swimming Club swimmers medalled at the Derventio Excel long course meet in Sheffield last weekend against top competition from across the country. A squad of 10 travelled north for the Level 1 meet, which took place in the Ponds Forge international pool, and they won five medals and broke one club record. Beth Eagle-Brown added to her collection of age-group 100m freestyle Deepings club records by taking more than a second off the old mark for 16-year-olds, swimming 59.56s to claim bronze. She added a second bronze in the 50m butterfly with a personal best and achieved a second PB in the 100m butterfly, finishing sixth. Tom Neal doubled up in the backstroke events with silver in the 17yrs/over 50m and bronze in the 100m. He also finished sixth in the 50m butterfly with a new PB of 27.04. Completing the medal-winning performances was 10-year-old Jacob Briers, who won silver in the 10/11yrs 200m breaststroke, swimming a new PB of 3:33.65. He also set a PB in the 200m backstroke, finishing sixth in 3:06.98. Also representing the club at the weekend for the girls were Holly Leggott, Jessica O’Herlihy, Lorna McGill and Emma Wilde. The quartet swam strongly, achieving several personal bests. O’Herlihy was the busiest swimmer, racing in five events. In the 100m freestyle, she hit a new PB of 1.08.56, and was unlucky to miss the Midland Qualifying Time by less than half a second. Tom Adams and Louis Metselaar completed the boys’ team. Adams had an action-packed weekend, racing in five events - the 50m, 100m and 200m butterfly, 100m breaststroke and 100m freestyle (swimming 56.33, a two-second PB). Metselaar competed in four events, achieving two PBs. His highest placed finishes were in the 17/over 50m and 100m breaststroke where he came fourth and was the top 17-year-old in both. His 50m time was a one-second PB of 30.72. Metselaar also achieved a three-second PB of 2:06.74 in the 200m freestyle and wrapped up his weekend with a 25.92 50m freestyle, just off his lifetime best. Many of the club’s up-and-coming members were in action at the Grantham Grand Prix. There were a number of top-three finishes among an incredible 52 personal bests by the team of 22. Lucia Karic took first in the 200IM and was second in the 50m freestyle in the 10yrs age group – both new PBs - while Alex Sadler won the 50m butterfly, was second in the 200m freestyle in a new PB and came third in the 50m backstroke. Lilly Tappern achieved three PBs including a new club record in the 200IM when finishing second in 2:44.55. She also took second in the 50m freestyle and was fourth in the 50m breaststroke. Deepings’ fine tradition in the 200IM was upheld by Grace Edwards, who finished second in a new PB of 3:14.75, while third-place finishes on the night went to William Burdock (200m freestyle and 50m backstroke, Freya Chiva (50m freestyle and 50m breaststroke) and Lewis Tarver (50m backstroke). All were new personal bests. Every squad member achieved at least one PB, including for the girls: Evie Fletcher, Sasha Johnson, Maya Sangiorgio, Millie Herrick, Emma Dennis, Holly Roffe, Maddy Partridge and Ella Gerrard; and for the boys: Aaron Sadler, Oliver Shepherd, Daniel Partridge, Joseph Black, Jack Cradock, Antony Hall and Ryan Weise.